As one of the most popular houseplants found in homes all around the world, the Ponytail Palm (Beaucarnea recurvata) is one of the easiest to grow and require very little maintenance by their owners. If you’re looking to add a splash of charm into your home, but don’t want to put much time or thought into it, then this tropical houseplant may just be the perfect choice for you. Originating from the arid landscapes of Mexico, the name Ponytail “palm” is a bit of a misnomer. While the bulbous trunk indeed had some similarities to the trunks of other palm trees, the Beaucarnea recurvata is actually a drought-resistant succulent. And that bulbous trunk is where the plant stores its water. Ponytail palms are one of the easiest houseplants to care for. They require little water, love lots of light, you don’t have to fertilize often, and they have the ability to adapt to the comfortable temperatures often found in homes. The downside of growing a ponytail palm inside your home is the incredible slow pace in which they grow. As long as you don’t over-water it, you probably won’t kill it. It’s pretty much that simple. However, if you want your plant to grow tall, thrive and be healthy, there are some easy guidelines you can follow to help you provide the best care for your ponytail palm. Water Once every ~10 days. Light Bright & full exposure to sun. Fertilize Once a month. Diluted liquid fertilizer. Temperature Warm. Keep above 55°F. Humidity Adaptable. Not too low. Maintenance Easy to care for. Safe for Pets? Yes. But, care should be taken. Container Size Depends on how large you want it to grow. To help ensure that you’re providing to proper care for your ponytail palm, we have listed out the most frequently asked questions down below. If you have a question that you don’t see listed or would like to add additional feedback for others to learn from, please leave it down in the comment section below. 1. How often do you water a ponytail palm? Not often, but the frequency depends largely on the environment you’re growing it in. Below, we have some general guidelines to watering a ponytail palm, but the best advice is to give it a drink of water when you see the soil start to dry. During Hotter Months — You’ll want to water your ponytail palm plant once every 7-10 days. During Cooler Months — You’ll want to slow down the watering schedule to once every 20-30 days. If you don’t abide to that precise schedule, don’t fret. This plant is great at surviving long periods without water. But, if you want a healthy plant that grows to its fullest, you should try to follow the watering guidelines listed above. Remember: The easiest way to kill a ponytail palm is by over-watering. Less is more. 2. How much light does it need? Ponytail palms love lots of light. Remember, this plant is native to arid deserts, so full exposure to the sun will be appreciated by this plant. However, while full exposure is recommended, ponytail palms are adaptable to little or moderate amounts of light. The downside of less light exposure is that you’ll see a noticeable slow down in its growth. And for an already slow-growing houseplant, this may just completely stunt it. So, if you want your ponytail palm to grow tall, give it lots of light. 3. How often should I fertilize a ponytail palm? Depends on the season and environment you’re growing your ponytail plant in. A general guideline is to fertilize your plant once every 3 or 4 weeks. If you see the tips of the leaves start to turn brown, then you’re using too much fertilizer. Spring & Summer — Add fertilizer once every 2 or 3 weeks. Fall & Winter — Add fertilizer once every 4 to 6 weeks. 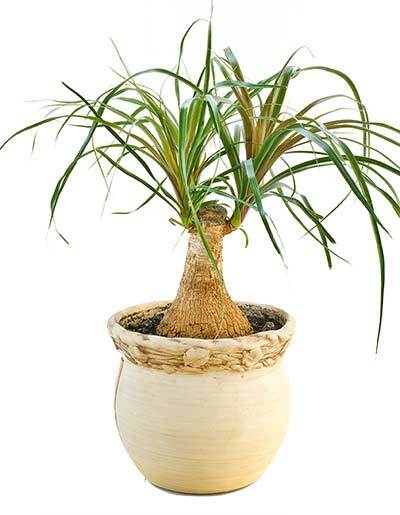 Adding fertilizer is essential to the overall health of houseplants, and Beaucarnea recurvata is no different. Liquid fertilizers are recommended for ponytail palms, but granular fertilizers will also suffice. An all-purpose fertilizer will work fine here, but you can also consider using one formulated for cactus and other succulents. The best type of soil for this plant is one that drains quickly. Unlike many popular tropical houseplants, the last thing the ponytail palm wants is to sit around in moist soil for an extended period of time. When you repot or transplant, it is recommended that you use a soil designed for cactus or succulents. If you want to make your own soil mixture, keep it light on the amount of peat you use within. Remember: Keep the soil dry, and water sparingly. 5. Is repotting possible with a ponytail palm? Yes, repotting a ponytail palm is possible and easy to do, but precautions should be made before you undertake this effort. Size Matters — First, consider how large the tree is, and where you’re going to be moving it to. Larger plants will likely require more help from others, as well as a few other tools or equipment to assist in the transplant. On the flip side, if you’re repotting a small bonsai ponytail palm, then you likely won’t need any help or special tools. Do In Spring — It is recommended that repot your ponytail palm early in the growing season, as this gives it plenty of time to adjust to the larger pot and form strong roots. Examine the Roots — Once you have it out of the original container, take a close look at the roots of your plant. Look for any signs of bugs, rotted areas, or anything that looks injured or contaminated. Cut these off before you repot in new container. Keep in mind: Transplanting it to a larger pot will encourage the plant to grow larger. This may be a deal-breaker for anyone growing a bonsai palm. 6. Is this plant safe for pets? According to the ASPCA, the ponytail palm does not pose any toxicity threats to dogs or cats. 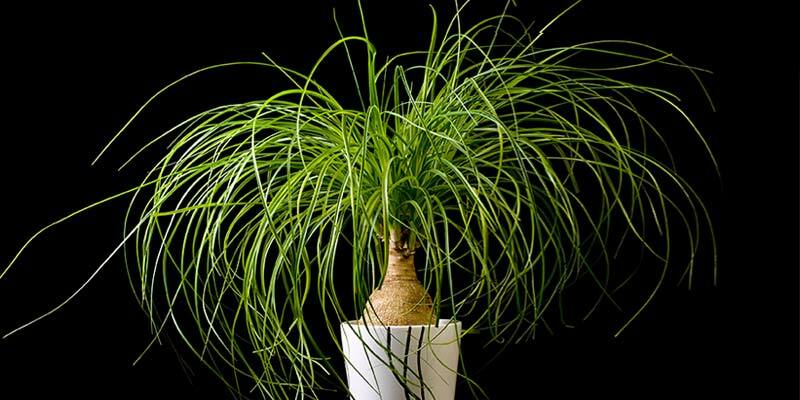 However, every homeowner with pets should know, and possibly take precautions if deemed necessary, that the leaves of the Beaucarnea recurvata contain saponin which may cause discomfort in some animals if ingested. So, while it’s unlikely that any harm will come to your dog or cat, it may be wise to keep an eye on them and ensure that they are not eating or chewing on the leaves. It’s also worth noting that saponins are found in many popular houseplants, not just the ponytail palm. They also pose no danger to humans. In fact, saponin is found in many dietary supplements and are suggested to have some nutritional benefits. 7. Can you grow a ponytail palm outside? Yes, but it’s recommended that you live in USDA Plant Hardiness Zone 10 or 11 if you want your plant to thrive. The sandy soil and hotter temperatures create an ideal environment for growing the ponytail palm outside.